Considered by many to be one of the fastest and most effective ways to cure illnesses, speed healing, correct behavioral problems, and/or to improve overall health and "performance," chiropractic care isn't just for humans anymore. 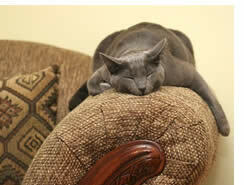 Canines and cats alike are now benefiting from what renowned veterinarians Drs. Richard and Susan Pitcairn describe in their critically acclaimed book, Natural Health for Dogs and Cats, as "the largest drugless healing profession" in the United States. Chiropractic care for critters is much more though than a "spinal-snap-crackle-and-pop-pathway" to help your furry, feathered, or scaled companion feel better. By using various physical or mechanical methods to maneuver a displaced joint back into alignment, regardless if it's Fido's "out of whack" knee or Garfield's "out of kilter" jaw, pet owners often do witness immediate positive results as the patient is freed from their pain or discomfort. However, such drastic improvements aren't brought about simply because shifted bones are now "back in place." Think of it as more of a chain reaction of relief - "the thigh bone connected to the back bone" scenario. Displaced joints often press on surrounding nerves, which in turn can cause excruciating pain. Blood flow to the area also usually decreases, including to nearby organs, which causes a decrease in their efficiency. Muscles often begin to spasm, mobility then becomes restricted, one's posture is altered, and the problem just continues to spiral out of control, negatively affecting even more joints and organs. Once the misaligned joints are realigned with the aid of a chiropractic adjustment, the associated problems are also often instantly reversed. However, some of the positive effects from such adjustments might surface more slowly and/or your pet might require multiple treatment sessions for maximum improvement to be reached. Chiropractic care can be used hand-in-hand with traditional veterinary care, in association with other holistic therapies such as acupuncture, as an alternative to drugs or surgery, or as a form of maintenance/preventative health care. A young, agility-course-trained dog can benefit just as much from chiropractic treatments as an elderly couch-potato kitty can. Whether your pet is suffering from such ailments as a chronic digestive disorder, acute partial paralysis due to a recent trauma, epilepsy, incontinence, or a skin condition, relief might be just a mere chiropractic adjustment away. If you'd like to find a chiropractor that can treat your precious pet - for whatever reason or desired outcome - there are three simple steps you can take to find a qualified professional in your area. As requirements actually vary by state, the first step in the process involves becoming familiar with the legal requirements for animal chiropractors in your specific area. Some states require that individuals must be licensed veterinarians while others only require a human chiropractor to be working with a veterinarian's referral or under a veterinarian's supervision. Verify your area's specific requirements by contacting your state regulatory agencies. The website for the American Association of Veterinary State Boards provides contact information for such regulatory agencies, as well as licensing and credentialing requirements. Once you've identified the regulatory requirements associated with animal chiropractors in your area, you can move on to Step #2. This step involves searching the various lists that exist for assisting individuals in locating animal chiropractors in their area. The first list you should consult is the one that's maintained by the American Veterinary Chiropractic Association (AVCA). Such an organization trains and certifies both licensed Doctors of Chiropractic and Doctors of Veterinary Medicine in animal-related chiropractic adjustment techniques. Remember though - such certification is contingent on the previously mentioned state regulations. Someone could actually be certified as an animal chiropractor, but they might not legally be able to practice in certain areas. Confusing, we know. That's why we had you start with Step #1 to figure out what the requirements are for your state. You can access the AVCA's list of Certified Doctors that are located in the United States, Canada, Europe, and Australia by going to their main website at www.animalchiropractic.org and clicking on the "Referrals" option or by going to www.avcadoctors.com and clicking on the option to "Search for an AVCA Doctor" . The American Holistic Veterinary Medical Association (AHVMA) also maintains an extensive Member Referral Search site at www.holisticvetlist.com . Such a list covers the United States, Canada, and several other countries. Almost three dozen holistic treatment methods can be searched, including chiropractic. Such a search can be further broken down into various schools of chiropractic, treatment methods used, and certifying organizations. The final list to refer to is the one related to practitioners of the Veterinary Orthopedic Manipulation (VOM) technique - a method that relies on various mechanical devices to deliver the stimulation necessary to realign joints. You can access such a list by visiting the main VOM website at www.vomtech.com , clicking on "A Pet Owner" option, and then the link to "Find a Practitioner near You." This list contains more than 1,200 VOM practitioners that are located throughout the United States and Canada. What specific veterinary and/or chiropractic credentials do they have? How long have they been a practicing animal chiropractor? What specific method(s) of chiropractic manipulation do they use? What experience do they have treating your species/breed of pet and the specific type of ailment/condition you're seeking help for? 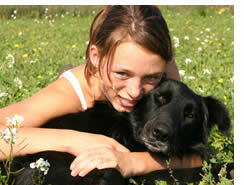 What would a "regular" chiropractic visit entail for you and your pet (e.g. time per session, fees per treatment, pre- and post-session requirements, etc)? A word to the wise - regardless of where this three-step process takes you, you should NEVER allow a human chiropractor that is untrained in animal anatomy and/or animal chiropractic procedures to work on your pet. Serious injury - or worse - could result. With a little bit of time spent identifying your state's animal chiropractic regulations, researching lists of animal chiropractors in your area, and "interviewing" potential animal chiropractic candidates, you'll greatly increase your chances of successfully selecting the best practitioner for your precious pet. Our pets ask so very little of us, it's the least we can do for them. Now get cracking and do your research!